A typical Keepalived high-availability configuration consists of one master server and one or more backup servers. One or more virtual IP addresses, defined as VRRP instances, are assigned to the master server's network interfaces so that it can service network clients. The backup servers listen for multicast VRRP advertisement packets that the master server transmits at regular intervals. The default advertisement interval is one second. If the backup nodes fail to receive three consecutive VRRP advertisements, the backup server with the highest assigned priority takes over as the master server and assigns the virtual IP addresses to its own network interfaces. If several backup servers have the same priority, the backup server with the highest IP address value becomes the master server. 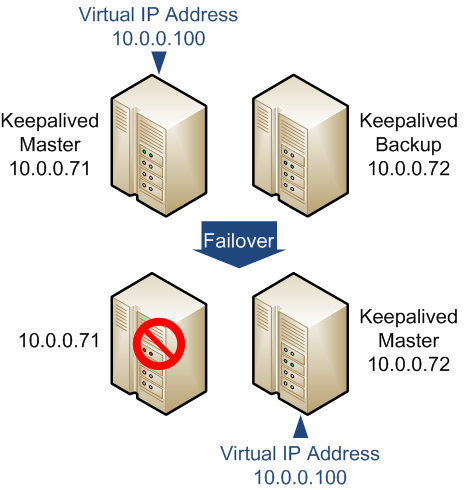 The following example uses Keepalived to implement a simple failover configuration on two servers. One server acts as the master, the other acts as a backup, and the master server has a higher priority than the backup server. Figure 17.2 shows how the virtual IP address 10.0.0.100 is initially assigned to the master server (10.0.0.71). When the master server fails, the backup server (10.0.0.72) becomes the new master server and is assigned the virtual IP address 10.0.0.100. In the event that the master server (svr1) fails, keepalived assigns the virtual IP address 10.0.0.100/24 to the eth0 interface on the backup server (svr2), which becomes the master server. ...53:09 ... VRRP_Instance(VRRP1) setting protocol VIPs. Only one server should be active as the master at any time. If more than one server is configured as the master, it is likely that there is a problem with VRRP communication between the servers. Check the network settings for each interface on each server and check that the firewall allows both incoming and outgoing VRRP packets for multicast IP address 224.0.0.18. See Section 17.5, “Installing and Configuring Keepalived” for details of how to install and configure Keepalived.